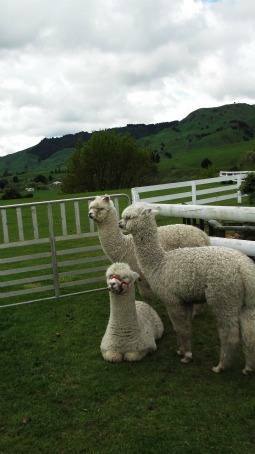 Nevalea Alpacas is 16kms north of Taumarunui, about 15mins drive from Taumarunui Holiday Park. Alpacas originated from South America and are a member of the camelid family, the largest percentage coming from Peru and Chile. They are related to camels, Llamas, vicunas and guanacos. Alpacas have been valued for their soft luxurious fleeces for generations, indeed their fleece has been called ‘the fibre of the gods’. Alpaca fibre was so valued by early South American civilisations that it was used as a form of currency. Leonie and Neville Walker started their herd of huacaya alpacas in June 2007 with two breeding females with cria (baby alpacas) at foot. They now farm over 170 alpacas, and will continue to grow the herd. Each alpaca is known by name and each has their own special personality, their fibre is used in the products and garments for sale in the farm shop. Nevalea Alpacas enjoy sharing their experience with others, and welcome visitors and groups to come by appointment and experience these lovely animals for themselves. Please let us know if you would like to visit Nevelea Alpacas during your stay with us and we will happily call them to set up a time for you to visit. Buzz through to the Nevalea Alpacas website!